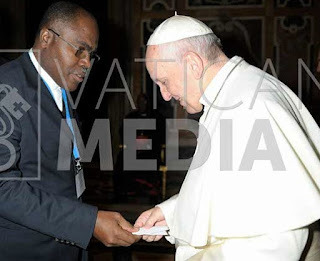 The sign of solidarity reached the hands of Francis through a shared ticket at the audience on March 8, 2018, when the Pope received the members of the council of the International Catholic Emigration Commission (ICMC). Father Claudio Reis, for IMBISA, was the protagonist of the gesture (in the photo) leaving in the audience and in the hands of the Pope the thanks of the community for the day of the Fast, recently proclaimed by the Pope. Lóvua, in Lunda Norte province, Angola province – Dundo diocese was recently visited by IMBISA head priest, Father Cláudio dos Reis, and is one of the camps that receives the fugitives from the DRC. The political situation in that country has brought many people to Angola in recent months. Those who come to that country are mostly women and children.The first field created to accommodate them proved to be small and a larger one had to be created. The dioceses of Angola and São Tomé have been campaigning to help the refugees to the Diocese of Dundo, many of them still involved in campaigning for this Lent for the same purpose.